Sharkbait's Favorite Crackers (Red) - Rare drop from Challenger's Cache / Harlan Sweete in the Mythic Freehold dungeon. Squawks (Green) - Rare drop from Island Expeditions. Mecha-Mogul Mk2 - Craftable Engineering Mount from Schematic: Mecha-Mogul Mk2, which can be aquired from Mogul Razdunk in the Motherlode dungeon. Mummified Raptor Skull (Tomb Stalker) - Rare reward from the Challenger's Cache / King Dazar in the Mythic Kings' Rest Dungeon. 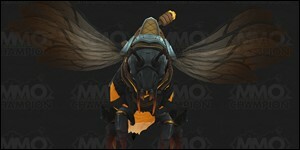 Underrot Crawg Harness - Rare reward from the Challenger's Cache / Unbound Abomination in the Mythic Underrot Dungeon. 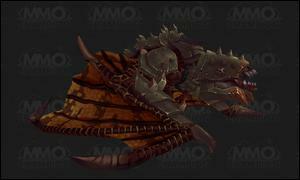 Bloodgorged Crawg - Reward for completing Glory of the Uldir Raider. Zandalari Direhorn - Unlock the Zandalari Troll Allied Race. 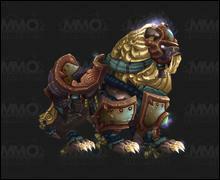 Mag'har Direwolf - Unlock the Mag'har Orcs Allied Race. Dark Iron Core Hound - Unlock the Dark Iron Dwarves Allied Race. Summon Darkforge Ram - Available to Dark Iron Dwarf Paladins. Summon Dawnforge Ram - Available to Dwarf Paladins. Reins of the Obsidan Krolusk - Reward for completing Glory of the Wartorn Hero. 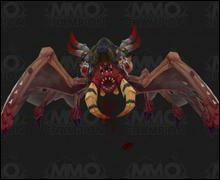 Conquerer's Scythemaw - Reward for completing Conqueror of Azeroth. Smoldering Reins of the Teldrassil Hippogryph - Alliance reward for Pre-Patch Event. 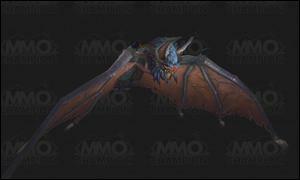 War-Torn Reins of the Undercity Plaguebat - Horde reward for Pre-Patch Event. Chewed-On Reins of the Terrified Pack Mule - Drops in Drustvar. Captured Dune Scavenger - Drops in Vol'dun. 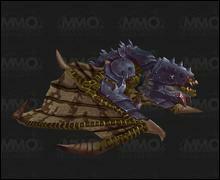 Reins of a Tamed Bloodfeaster - Drops in Nazmir. 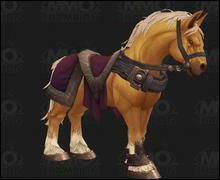 Goldenmane's Reins - Drops in Stormsong Valley. 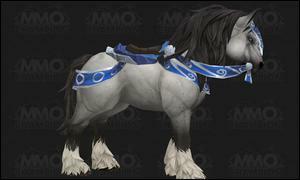 Reins of the Admiralty Stallion - Purchase from Provisioner Fray upon reaching exalted with Proudmoore Admiralty. 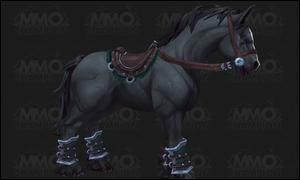 Reins of the Dapple Gray - Purchased from Sister Lilyana upon reaching exalted with Storm's Wake. 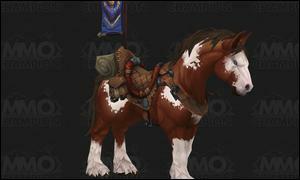 Reins of the Smoky Charger - Purchased from Quartermaster Alcorn upon reaching exalted with The Order of Embers. 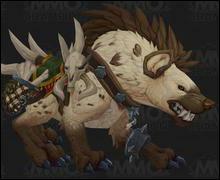 Reins of the Alabaster Hyena - Purchased from Hoarder Jena upon reaching exalted with The Voldunai. 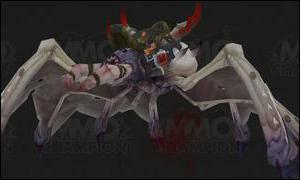 Reins of the Expedition Bloodswarmer - Purchased from Provisioner Lija upon reaching exalted with Talanji's Expedition. 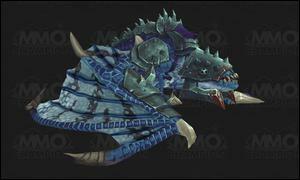 Reins of the Cobalt Pterrordax - Purchased from Natal'hakata upon reaching exalted with the Zandalari Empire. 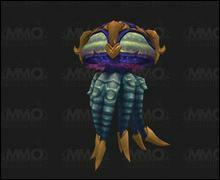 Kua'fon's Harness - Complete How to Ptrain Your Pterrordax by collecting an egg drop from pterrordax mobs in Zandalar and doing a serious of daily quests. 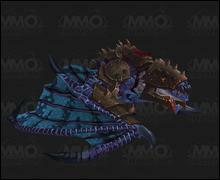 Vicious War Basilisk - Alliance Vicious Saddle Mount. 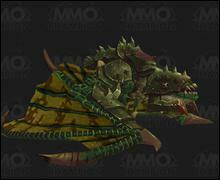 Vicious War Basilisk - Horde Vicious Saddle Mount. 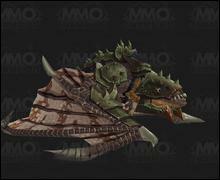 Vicious War Riverbeast - Alliance Vicious Saddle Mount. 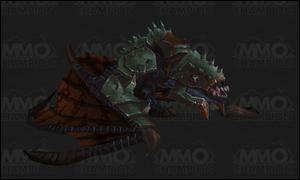 Vicious War Clefthoof - Horde Vicious Saddle Mount. 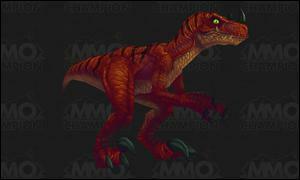 Reins of the Mighty Caravan Brutosaur - Purchased from Tricky Nick (Alliance) or Talutu (Horde) for 5,000,000 Gold. 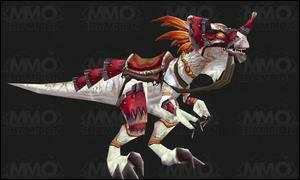 Reins of the Palehide Direhorn - Purchased from Tricky Nick (Alliance) or Talutu (Horde) for 500,000 Gold. 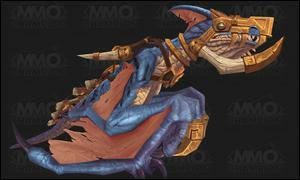 Prestigious Bloodforged Courser - Reward for reaching Honor Level 500. Pureheart Courser - Reward for completing 100 Exalted Reputations. Biting Frostshard Core - Reward for completing No Stable Big Enough. Frenzied Feltalon - Reward for completing A Horde of Hoofbeats. Nazjatar Blood Serpent - Secret find in Stormsong Valley. While the bee mounts are in the game files, it is unknown where they are acquired as of now. Last edited by chaud; 2018-08-12 at 08:36 PM. 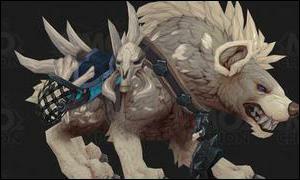 Sad that they removed the gryphons due to people complaining, I was looking forward to those the most for RP reasons. 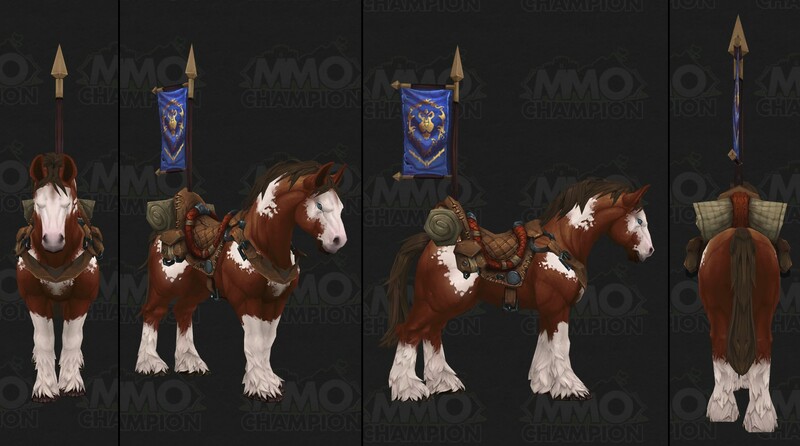 But overall, great expansion for mounts, made for people who like simple things and extravagant things, ones that looks nice with a lot of armor. Sorry, I'm a bit out of the loop. 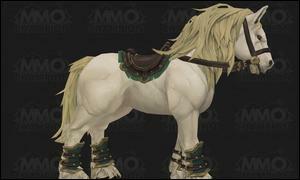 I saw those mounts and thought they were okay, did we get anything to replace them? Or did Horde lose something too? 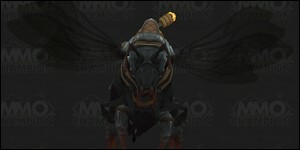 Horde lost all the flying pterrordax recolors - there were 3 more colors (as Alliance had 3 different gorgeous gryphons). Now we only have the blue one. I play both factions and I'm really sad they removed all the extra options just because of recolor complaints. I was really looking forward to the gryphons. 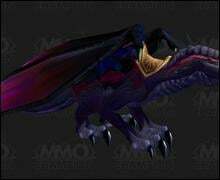 Some of us actually liked the mounts, Blizzard. Blizzard with their Horde love. AS ALWAYS! 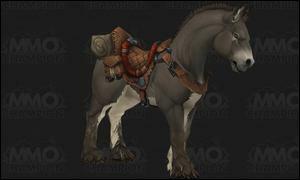 Alli gets 3 ugly horses and Horde gets 3 different types on mounts. I am pretty sure Goldenmane isn't unkown it drops from stormsong valley like the other 3 Bind on Equip World Drops so there is 2 per continent. But I've done enough serious WQ'ing in Legion for them RNG rep mounts to last me a lifetime of not wanting to do another daily...! Who said it will be fair? Horde get: A sweet looking hyena-beast, an armored dinosaur, and a friggin' flying giant spider. 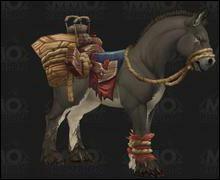 Alliance get: A horse, a horse, and a horse. 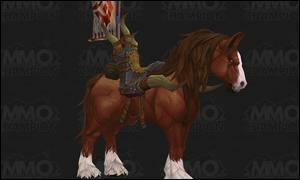 From what I've heard, the alliance get some of the same mounts horde get when they cross over and do the rep. So alliance still get them. "and doing a serious of daily quests." Probably the same situation as when Chris Metzen was sorted into the Alliance team during the Azeroth chopper event when people are not motivated to work on something you get well this, maybe I am wrong I hope I am but I find it really sad they could not come up with something better than horses. Last edited by Karamaru; 2018-08-12 at 10:22 PM.